The Digital Color Center prints business cards to books and everything in between: brochures, postcards, greeting cards, posters, flyers, signs, appointment cards, prototypes, promotions, press proofs, and test runs for larger jobs. It also prints materials in which each piece is customized for a specific reader (termed variable data printing or mail merge). For pieces that are 11.5 x 17 inches or smaller; gloss and matte stock in both text and cover weights; electronic files required. For posters, signs, and displays up to 48 inches wide; 100-foot rolls of coated gloss paper; small quantities; electronic files required. Contact the Color Center, 384-3716, for more information. Use to personalize printed material; print individual's name throughout a document; variations in text, photos, graphics, and layout possible for each piece; customer-generated electronic address file needed. Contact the Mailing Services manager for more information. 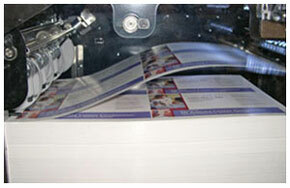 The press and poster printer both provide crisp, high-definition, full-color images. The press uses a laser technology that reapplies the image to the printing plate for every impression, so each sheet is a high-quality, first-generation print with consistent color and image quality throughout a run. 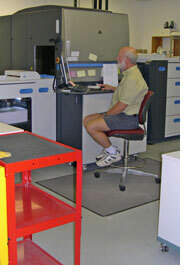 The patented liquid ink produces reliable color for proofing, and the spot color simulates most PMS colors. Because computer monitors may not accurately represent printed color, ask to see samples if you are new to this process. Digital color press: pdf file, PDF/X1-a:2001 format. Color posters: pdf file, High Quality Print format. Address files: Excel file, csv format. Once saved, you may send files over the Web or on disks. Please contact us if you have questions. Place orders online at printing.uiowa.edu/webprint. You'll need to download our printer drivers and PPDs. Contact one of our computer consultants if you need help. Average turnaround is less than a week. Our workload at any given time can be a factor, so call in advance if you have an absolute deadline. You may use an m-number or University of Iowa ID for online orders. Otherwise, fax or mail a requisition to the Digital Color Center, 180 MBSB. An m-number is a standing account, established by sending or faxing a completed requisition for one to the Printing and Mailing Services accounting office, 130 MBSB, fax 384-3806. Standard UI requisitions are available through your department. Make sure all requisitions you send have two authorized signatures. We will make estimates for specific jobs on request. We welcome your visits to see the equipment at work and to look through samples of our printed material.